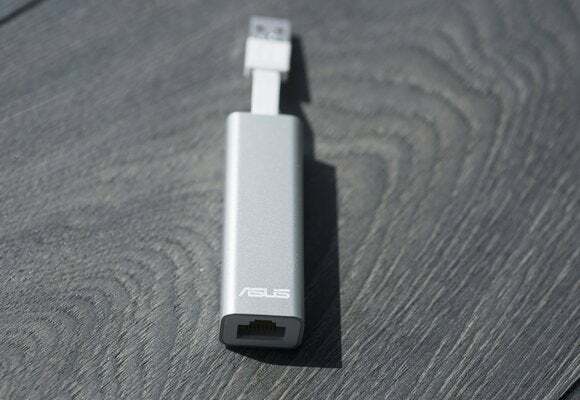 The Asus WL-330NUL is even tinier than TP-Link’s diminutive TL-MR3040. In fact, it’s smaller than some USB thumb drives I’ve used. Its size and weight will tempt anyone who insists on traveling light. My advice: Resist that temptation. The WL-330NUL is a very simple device. There’s a USB 2.0 connector on a stubby cable at one end, and an RJ-45 ethernet port on the other. Inside is an 802.11b/g/n chipset that supports one 150Mbps spatial stream on the 2.4GHz frequency band. It has no other USB port, so it can’t share files on an attached USB storage device, nor can it support a cellular USB modem. The router left the factory with the preassigned password "Test1234." Seriously? You can operate the WL-330NUL in one of four modes: If you provide a USB power adapter, it can perform as a wireless router when connected to a DSL or cable modem or another hardwired Internet connection (such as you might use in a hotel or convention center), or as a wireless router when connected to a WISP (Wireless Internet Service Provider). While drawing power from a laptop, it can perform as a wired or wireless USB ethernet adapter for an Ultrabook or other thin-and-light laptop that doesn’t have an ethernet adapter of its own. The Asus WL-330NUL is fairly slow at close range, which is about the only range it has. So it’s more limited than several of the larger travel routers, but that’s a reasonable trade-off for its size. This router’s performance, on the other hand, was near the bottom of the pile. With the client in the same room, nine feet from the router, the WL-330NUL managed to deliver TCP throughput of just 20.8Mbps. When I moved the client to the kitchen, 20 feet from the router and separated by one wall, throughput dropped to a meager 3.1Mbps. The router couldn’t reach the client at all when I moved it to my home office, 65 feet away with several walls in between. The rest of this review is dedicated to those who decide that the WL-330NUL’s miniature proportions outweigh its performance shortcomings, but encounter trouble setting it up. Few things in this world are more maddening than a poorly written user manual. I have a bad habit of plugging things in and stumbling my way through the installation process. When I review a product, however, I always try to follow the vendor’s installation procedure as outlined in the product’s user manual; the manufacturer deserves the due diligence. In this case, Asus’s user manual instructs you to plug the WL-330NUL into a USB power source (Asus doesn’t provide one, so I used the one that came with my phone), wait for the router to boot up, select its SSID on the computer you want to wirelessly connect to it, and then enter the “supervisor code” (i.e., the preconfigured WPA2 passphrase) that's helpfully printed on the side of the router. I finally committed the act that reviewers hate to resort to: I called PR for help. The utility is stored on the router itself, which is why you need to connect the router to the computer (oddly enough, you won’t find it on Asus’s support website). So I installed the utility, but I still had no luck connecting to the router when it was plugged into my ADSL gateway. The WL-330NUL doesn’t support WPS (Wi-Fi Protected Setup) via either a button or software, but that’s a good thing. If it did, any user who relied on that would have unwittingly ended up using one of the most easily hacked network passwords imaginable. Should you decide this router's dimensions override its lack of features and performance shortcomings, just make sure that the factory-assigned passphrase matches what's on the router (or change it to something even more secure). 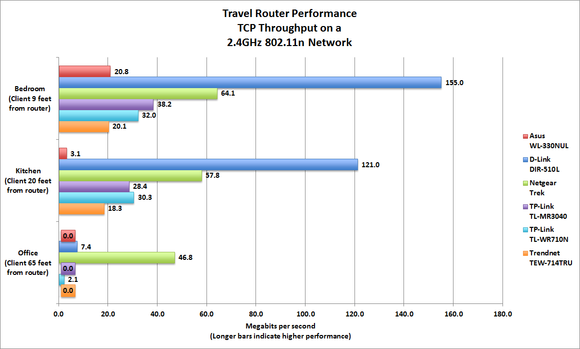 Update: The benchmark chart measuring each router's performance on the 2.4GHz frequency band has been corrected.